The database would allow the five member-states to consolidate ideas and research from wherever they are generated across the spectrum of BRICS interests. Members of the BRICS Think Tanks Council (BTTC) reached agreements on establishing a database that will help the bloc of five biggest emerging economies “to share knowledge across a wide range of fields,” a report issued after the completion of the BTTC’s two-day meeting said. Speaking at the meeting, held near Stellenbosch in South Africa’s Western Cape, the country’s Deputy Minister of Higher Education and Training, Mduduzi Manana, recalled the important role the BTTC could play in using the intellectual resources of its networks. This would allow the five member-states to consolidate ideas and research from wherever they are generated across the spectrum of BRICS interests, and make sense of them for practical implementation and advancement of the BRICS agenda. Manana said the BTTC should play the role of “brains behind BRICS’ strategic decisions”. “It is, therefore, important that this council of intellectuals is able to work together and to seek solutions to intricate international problems,” he said. The meeting also reviewed progress on the achievements of the member-nations’ think tanks since March 2013. It adopted the terms of reference for the functioning of the BTTC and updated the vision and long-term strategy for BRICS, due to be finalized prior to the sixth summit meeting of BRICS and submitted for consideration to the respective governments. 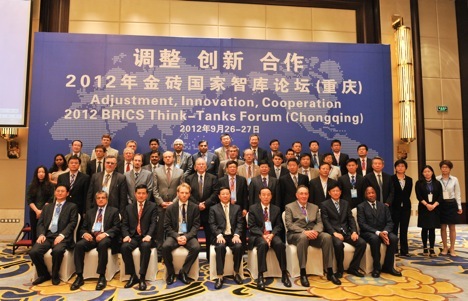 The BTTC comprises think tanks from Brazil, Russia, India, China and South Africa. It was established on the basis of a declaration that called for increased ministerial meetings on the sidelines of international conferences and events. The declaration also called for the formation of a platform for the exchange of ideas among researchers, academic quarters and think tanks. The declaration was adopted by the BRICS leaders at the eThekwini Summit on 27 March 2013. It also encouraged convening the annual BRICS Academic Forum, making policy recommendations and giving guidance to the constituent countries’ leaders.